Spotlighting the voice talents of stars like Boris Karloff, Mickey Rooney, Andy Griffith, Shelley Winters, Red Buttons, Ethel Merman, Red Skelton, Frank Gorshin, Hans Conreid, Roger Miller and too many more to name, here is the perfect holiday treat! Coupling six Bass and Rankin treasures with two Dr. Seuss standards and Christmas cheer just overflows. 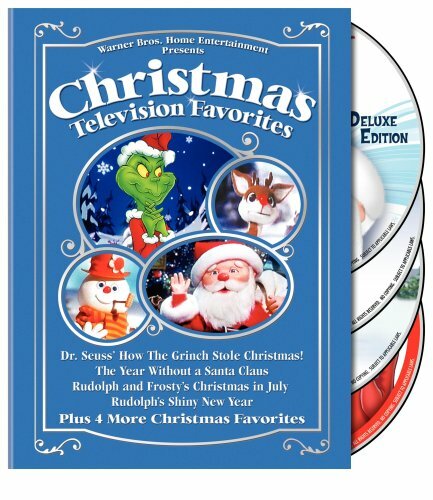 Includes How the Grinch Stole Christmas: Deluxe Edition (1966/26 min. ), Horton Hears a Who! (1970/26 min. ), The Year Without a Santa Claus (1974/51 min. ), Rudolph's Shiny New Year (1976/47 min. ), Nestor, the Long-Eared Christmas Donkey (1977/22 min. ), Frosty's Winter Wonderland (1976/25 min. ), 'Twas the Night Before Christmas (1974/25 min.) and Rudolph and Frosty's Christmas in July (1979/97 min.). 4 DVDs. Animated. Color/NR.